OnStage Playhouse and Turning Tydes Theatre Company present this "play-within-a-musical," based on Charles Dickens' unfinished novel. 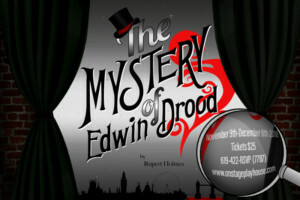 "Everyone on stage is a suspect in the murder of young Edwin Drood." Alex Bezdeka directs, with musical direction by Jordan Hall Campbell.